Hotel Financing & Hotel Construction Loans Starting at $5 Million! Assets America® has been serving clients in the commercial finance and commercial real estate sales arena for more than 30 years. We have decades of experience funding large commercial real estate loans including of course, one of our favorites, hotel financing! In addition to hotel financing, we are also able to perform hotel acquisition and sales brokerage services from beginning to end, soup to nuts. When you need a hotel loan (hotels loan, about which some have inquired), or any hotel and/or hospitality transaction services, turn to Assets America® for unbeatable, professional, yet highly personal and incredibly responsive service with outstanding results. 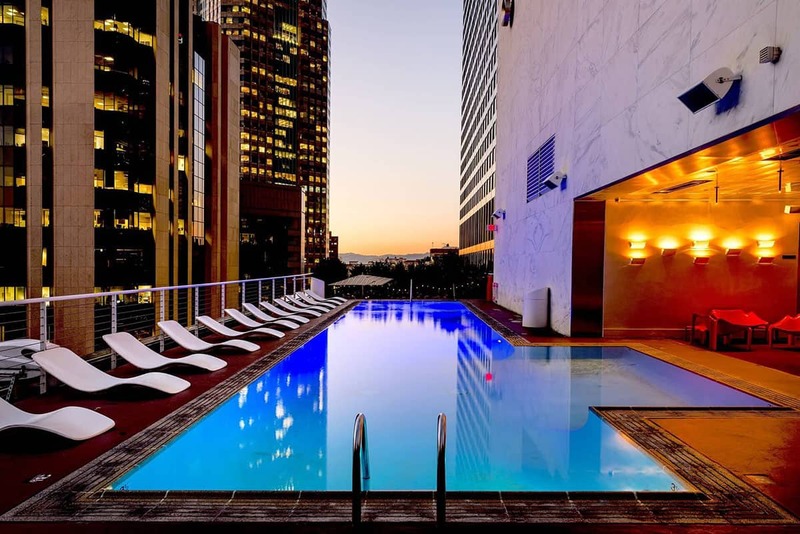 Hotels are facilities that offer short-term lodging, although some offer long-term leases or sale of some of their inventory as condominium apartments. Hotel buildings range from small structures with only a few rooms to elaborate complexes with multiple buildings and extensive property. Hotel rooms vary greatly in their quality, size and cost. Some offer little more than a mattress and running water, but most provide a variety of amenities from basic to ultra-premium. Most decent or better hotels offer a good quality bed, air conditioning/heating, a dresser and other furniture, a bathroom and a television. Many hotel rooms offer kitchen facilities – a refrigerator, microwave oven, coffee maker and a sink. High-priced luxury hotels offer richly decorated, spacious rooms and amenities like a swimming pool, lounges, bars and restaurants, childcare, in-room massage, room service, business centers, workout rooms, conference facilities, and even tennis courts and golf courses. Some of the top hotels offer rooms with four-figure daily rates, although at the opposite end of the spectrum you can find roadside motels charging less than $30 per night for bare-bones accommodations. Some motels offer hourly rates for occasions when guests only require brief use of a room. Other hotels, known as flophouses, house both transients and long-term guests at cheap prices for minimal amenities – tiny rooms, shared bathrooms, and little or no cleaning service. Flagged hotels are brand-name establishments owned directly by the parent hospitality corporation (i.e., “managed” hotels) or by franchisees. The flagged hotel market is dominated by names like Marriot, Hilton, Hyatt, Four Seasons, Radisson, Choice, and Red Roof Inn. Often, hotel companies carry several flagged brands that represent different trade-offs between amenities and price. For example, Choice Hotels owns properties under the Comfort Inn, Comfort Suites, Quality Inn, Sleep Inn, Clarion, Cambria Hotel & Suites, Mainstay Suites, Suburban Extended Stay, Econo Lodge, Rodeway Inn, and Ascend Hotel Collection brand names. These brands address several markets: budget, extended stay, business travel, and so forth. Financing for the construction and renovation of flagged hotels is usually supplied by the parent corporation. For hotel franchises, the franchisor usually provides franchisee-financing programs, but may require the franchisee to satisfy certain operational and financial requirements. A non-flagged hotel is independently owned and operated. It can occupy any niche and location, but since it is not a member of a franchise, it must be financed externally. Many non-flagged hotels are family owned. They may compete head-to-head with flagged hotels or may be situated in areas where few competitors exist. Non-flagged hotels do not benefit from the name recognition enjoyed by flagged properties, and thus often compete on price. Flagged hotels, especially ones with multiple brands, must guard against saturating a market and cannibalizing each other. For example, a Sleep Inn not far from an Econo-Lodge might steal customers from its corporate cousin, to the disadvantage of the parent company. Corporations try to minimize cannibalization by avoiding nearby placement of similar properties. Instead, they may try to saturate a market by clustering hotels that appeal to different budgets and niches. Franchise agreements usually specify the degree of permitted market saturation. Franchise arrangements have special considerations. For example, when a franchisor works with a lender to provide hotel financing to a franchisee, the lender usually demands a “comfort letter” spelling out the lender’s right to operate the hotel should the franchisee default on its loan. The lender might sell of the property, but it might want to operate the defaulted property (usually via a hotel management firm) under the flag name, which is an intangible but valuable asset. Comfort letters are usually uniform for each hotel brand. Flagged hotels make sense when each property meets certain mandated standards of the brand. These brand mandates ensure that guests receive the same, uniform level of satisfaction at each property. Whether the brand is managed or franchised, it is in everyone’s best interests to maintain standards for prices, accommodations and service. Brand standard audits are commonly used to evaluate compliance to brand mandates. Hotels that repeatedly fail a brand standard audit face sanctions up to termination of the franchise agreement, removal of the brand, and exposure to damages resulting from a lawsuit. Managed hotels that fail an audit may undergo a change of management personnel. Re-imaging is a process in which a hotel is adapted to appeal to a different audience. The process might be as simple as adoption of new logos or as complex as reconstruction of existing physical facilities. Often, re-imaging is used to move a hotel upscale or to cement a particular perception of quality. Re-imaging a flagged hotel requires a marketing makeover of the brand. For independent, non-flagged hotels, re-imaging can mean adding amenities and boosting quality, as when a two-star hotel re-images itself as a three-star hotel or even a four-star hotel property. These properties are built-in destinations, with entertainment amenities that attract guests. Casinos, water parks, holiday resorts, golf courses, fine restaurants, day spas and amusement parks are all examples of the types and level of amenities you might find at a resort hotel. Inevitably, the resort attractions are owned by, or have revenue-sharing agreements with, the hotel owner. The Las Vegas Strip is a place where many resort hotels reside in close proximity. The Disney Hotels at Walt Disney World are another example of resort hotels. Many resort hotels are situated at vacation destinations throughout the world. Luxury hotels offer top-quality amenities and charge premium prices. You’ll likely find on-site restaurants, full-service accommodations and a high level of professional, personalized service. Luxury hotels often carry designations like “Five Stars” or “Five Diamonds” to indicate their extremely, high-level, rarified standards. Famous luxury hotel brands include Four Seasons, Ritz-Carlton and InterContinental, to name just a few. These hotels are typically non-flagged, independently owned properties with upscale amenities, although flagged boutique hotels also exist. Facilities can vary from intimate to full service accommodations, but typically cater to fewer than 100 guests at any one time. Lifestyle hotels appeal to various groups of guests with shared interests, such as the athletically inclined, vegetarians or bird-watchers. Full-service hotels offer a wide array of amenities and guest services. These include on-site dining, conference rooms, business facilities and a fitness center. Many are luxury hotels, although mid-scale properties can also provide full services. Marriott and Hilton are good examples. These are medium-sized hotels to small-sized hotels with limited amenities geared to a defined set of travelers, such as single businesspersons. These facilities may lack certain features found in full-service hotels, such as on-site restaurants or a swimming pool. Hilton Garden Inn and Courtyard by Marriott are well-known examples. Economy hotels are usually smaller and focus on low prices. They offer basic accommodations, few on-site amenities and few services. Some offer complimentary breakfasts and vending machines. Popular examples include Holiday Inn Express and Days Inn. These hotels are small-to-medium sized hotels with special weekly or monthly rates that save money compared to day rates. Frequently, these rooms have kitchen facilities, and the property might have a laundry room. It’s a no-frills approach is meant to appeal to those traveling on a budget who need a room for a week or longer. Residence Inn by Marriott and Extended Stay America are two branded chains in this category. These hotels are vacation ownership properties in which individual units are sold and allocated to guests for a pre-defined usage period during the year. Timeshares are similar to full-service hotels except for their ownership arrangements. Destination clubs are more like resorts, often in a neighborhood-type setting. A motor hotel, or motel, serves guests traveling by automobile, bus or some other form of transportation. It’s usually a low-cost hotel with rooms that have direct access to an outdoor parking lot. Motels usually are modest facilities close to highways. Managed hotel companies sometimes buy up motels and re-brand the property under their own flags, perhaps rebranding from motel to lodge or inn. You use a microstay hotel when you need to book a stay for less than 24 hours. Customers choose when to check in and how long to stay. Microstays are often used by couples looking for short, private accommodations. They are also useful when bringing the whole family to an event, like a baseball game. Microstay hotels can sell the same room multiple times a day, thereby extracting more revenue per room. There are dozens of specialty hotels. Here is a short list, in alphabetical order: Bunker hotels, cave hotels, cliff hotels, capsule hotels, day room hotels, garden hotels, ice, snow and igloo hotels, love hotels, referral hotels, railway hotels, straw bale hotels, transit hotels, treehouse hotels, and underwater hotels. Assets America® arranges hotel loans for hotel construction loans as well as refinancing, reconstruction and acquisitions. The amount of financing you need depends on the following question: How much does it cost to build a hotel? The answer depends on the size and scale of the project as well as its financial characteristics. Securing hotel financing and hotel construction loans can often present a greater financing challenge than other property types. This is likely the case if you are planning a high-end, boutique or non-branded hotel (non-flagged hotel) project. It can also be the case if you are looking for a hotel construction loan to finance new-builds, conversions and renovations. A borrower’s determination of NOI often doesn’t fully align with the underwriting of hotel lender, meaning that the latter often implements underwriting adjustments based around occupancy levels, franchise marketing, management, and furniture and fixtures (F&E). For all but the most recently constructed hotel properties, finding permanent hotel financing with terms in excess of ten years requires convincing lenders that their collateral will not be down-flagged or become un-flagged or non-flagged during the hotel loan term or at loan maturity. When securing hotel financing or hotel construction loans for our clients, Assets America® uses its vast experience and understanding of hotel financing projects to match your hotel and hospitality project to one of our well-funded private or institutional hotel capital sources. This personalized service, mixed with our expert knowledge of policies, procedures, capital markets and operator transactions, saves our clients time and resources while ensuring the project is funded in the most financially beneficial way. Lenders formulate hotel loans as a combination of real estate and business loans consolidated into a single hospitality financing facility. The hotel loan uses the physical real estate (i.e. the hotel building) as pledged collateral. Accordingly, the loan must be approved in the same way as a traditional commercial real estate loan. There is also a requirement to prove the validity of the hospitality business as a viable and sound financial proposition. Hotel financing can take a number of different forms depending on whether you are looking to refinance a current hotel loan, renovate your hotel building, acquire an already built hotel, or build a new hotel. Naturally, this last option requires a hotel construction loan. Hospitality lending underwriters use certain metrics to determine whether to approve a potential hotel loan. Many hotel lenders have their own formula of underwriting criteria for assessing a project’s viability. The most widely used metric is Revenue Per Available Room (RevPAR), which is calculated as the hotel’s average occupancy multiplied by its average daily rate. This is especially critical if you are refinancing or using a hotel loan for renovation. Capital sources often want to analyze comparable hotels in your geographic location. This is yet another area where Assets America® can help. We bring market knowledge and expertise to the hotel financing process, providing our clients with real, tangible value. It is important to produce detailed, hotel project feasibility studies to verify your projections and proformas and to essentially “prove-up” your deal to the funding source. In particular, these studies must demonstrate your new hotel’s effect on local supply and demand. It is also important to understand that hotel construction loans are a different process from other forms of hotel financing. It is crucial to have an experienced, knowledgeable and reliable hotel lender/partner who understands both your business and the wider market. For decades, Assets America® has been an effective lender/partner for real estate owners and investors looking for hotel financing and hotel construction loans. In the first place, our expertise means that we can meet your transactional and financing needs. You also benefit from our long-term relationships with a range of well-funded capital sources and decision makers, which ensure your hotel financing deal is focused and optimized to your hotel loan’s specific and unique requirements. Revenue per Available Room (RevPAR index): This is the product of the hotel’s daily average room rate times its occupancy rate. A hotel is stabilized (i.e., ready for long-term financing) when its RevPAR Index (that is, its RevPAR compared to that of its competitors) reaches at least 90%. Net Operating Income: NOI is the hotel’s income minus its operating expenses. When divided into operating expenses, the result is the NOI expense ratio. For sizing a hotel bridge loan, a lender might look at the projected annual NOI for a three-year period at a 100% RevPAR index. Net Cash Flow: NCF is the hotel’s NOI minus debt service costs, management fees, reserves (such as reserves for furniture, fixtures and equipment, or FF&E) for one-time capital expenses and depreciation. Cap Rate: This is the hotel’s unleveraged value, equal to NOI divided by the average value of comparable properties (the comps). Lenders can then determine hotel loan size by applying a loan-to-value ratio to the hotel’s value. The lower the cap rate, the more valuable the hotel. Conversely, the higher the cap rate, the less valuable the hotel. Debt Yield: Lenders divide NOI by the loan amount to determine the hotel loan’s rate of return, or debt yield. A higher required debt yield translates into a smaller (lesser) hotel loan amount, all other things being equal. Loan-to-Value Ratio: Hotels can usually obtain financing with at least 70% loan-to-value (LTV) ratios. SBA-guaranteed loans can reach LTV values as high as 90%. Total Cost Basis: This is the total amount of money capitalized into the hotel project. Sometimes, the cost basis differs from the current value, which can affect refinancing and acquisition transactions. Loan Assumption Option: This is an option wherein the borrower is allowed to sell the hotel although it is encumbered by its current debt, and the new owner (the buyer) assumes the existing debt at the time of the sale. Additional Debt: Some lenders allow additional borrowing post-closing, often in the form of mezzanine financing. This allows a hotel buyer to assume senior debt and add more debt at closing, reducing the discount to market value for the seller. Longer Open Period: Usually, non-recourse hotel loans have a 90-day period at the end of the term in which the prepayment penalty is suspended. A lender can price in a longer open period that can save the borrower money. Banks are one of the primary sources of Asset America® brokered hotel loans from $5 million to $500 million and beyond. We use an extensive network of local and regional banks and national banks for loans to build a hotel (hotel construction financing), buy a hotel (hotel acquisition), refinance a hotel or renovate a hotel. Banks typically offer hotel financing with up to a 70% LTV ratio. Naturally, borrowers with high credit scores and a solid development background will have the easiest access to bank loans, but Asset America® offers hotel financing to borrowers with less than perfect credit histories. Banks can provide hotel construction financing through construction loans or bridge loans. Both are usually interest only with terms of 18 months to five years. Banks also offer revolving business lines of credit which are useful for reconstruction projects as well as FF&E expenditures. The Small Business Administration offers a couple of programs to guarantee hotel financing loans. 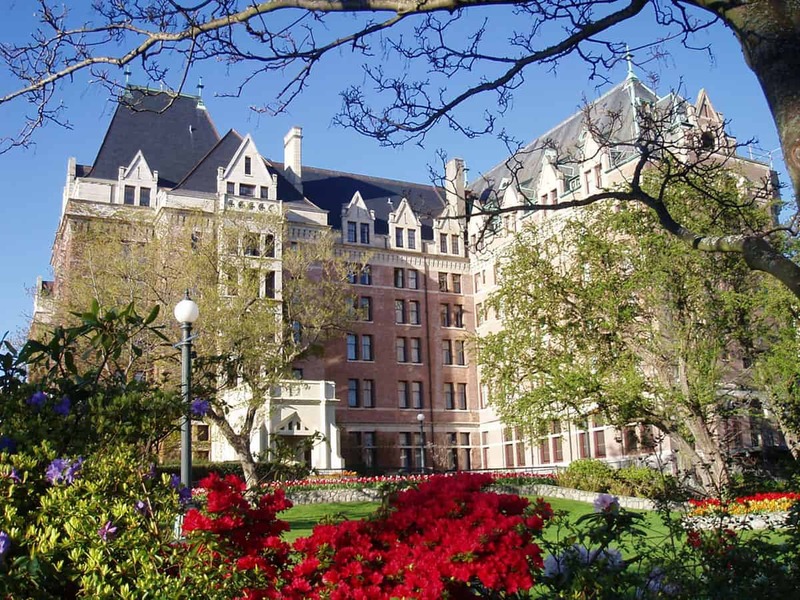 The SBA 7a loan program guarantees hotel financing loans of up to $7.5 million. The SBA 504 program helps hoteliers buy commercial real estate and equipment with loans up to $15 million. Both SBA programs have an LTC ratio of up to 85% and terms up to 25 years. A third program, the SBA Energy Efficient 504 program, can finance green hotel projects of up to $20 million and greater, with a 90% LTC ratio and terms from 10 to 25 years. The program is available for projects involving energy reduction or renewable energy. The United States Department of Agriculture offers rural hotel financing through its Business and Industry Guaranteed Loan Program. Hotel loans of up to $12 million are available with LTC ratios up to 90% and terms up to 30 years. Franchise Exclusive Lending Programs: Franchisors self-finance or work with lenders to extend hotel financing to franchisees. Strings are usually attached, such as a requirement for a comfort letter and adherence to Property Improvement Plan (PIP) mandates. PIPs require a franchisee to spend a certain amount of money over time to maintain the brand standards including FF&E and energy efficiency upgrades. Franchisors may offer hotel financing for PIPs, but this funding is also available through other sources, such as banks, the SBA and mezzanine loans. Private Lenders: Non-bank private sources of hotel financing include real estate investment companies, insurance companies, pensions, and a variety of commercial lenders. Private lenders are an important source for hotel financing when borrowers don’t meet bank underwriting standards. CMBS Conduit Loans: These loans offer attractive terms for large loans on high-end properties. The LTV ratio is typically 75% for these non-recourse, fixed-rate loans with terms up to 10 years on a 30-year amortization. In addition to Assets America’s® vast network of bank financing, our firm has a phenomenal array of non-bank, hotel financing sources starting at $5 million. In other words, we can provide hotel financing in any amount in excess of $5 million to literally hundreds of millions and even billions, if required. Of course, the construction of a new hotel project is the most complex form of hotel financing. Securing an optimum hotel construction loan is a similar process to financing a new business. The main similarity is the lack of any demonstrable performance history. There is a key difference, however, between a hotel construction loan and hotel refinancing. As you construct your hotel, you are building your hospitality project collateral. Hotel construction loans require significant capital. 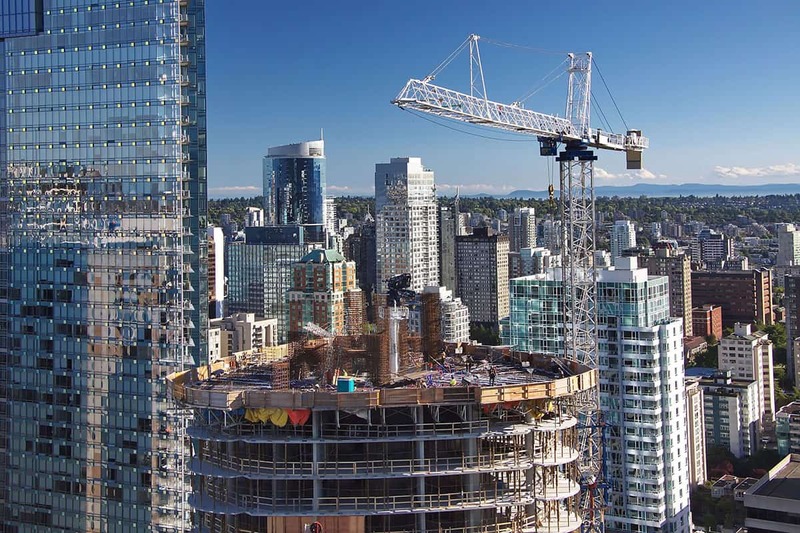 Your hotel financing project needs to account for large-scale construction down payments and the potentially long time period of construction. Financing must also last through the period required to gain a certificate of occupancy, open the hotel, and begin producing a revenue stream, which must be large enough to service the hotel debt and meet the operating costs and expenses. Hotel construction financing and bridge loans are available through Assets America® from banks and other sources. The SBA and the USDA offer loan financing guarantees for hotel construction as well as FF&E expenditures. Alternatively, hoteliers can arrange to finance FF&E through leasing. Our private lenders also compete to offer hotel construction financing. Hotel construction loans are usually interest-only with terms of 18+ months. The loans are refinanced or extended as necessary. Hotel renovation financing pays for improvements that increase the value and life of the hotel. Though it’s possible to self-fund renovations through operational cash flows segregated in renovation reserve accounts, many, if not most, hotels prefer to finance hotel construction renovations externally. PIP obligations require franchisees to maintain hotels to brand standards, which can require a significant amount of renovation financing. Renovation hotel funding is available through Assets America® from our sources of banks as conventional loans and/or business lines of credit. Commercial mortgage bridge loans are also used for hotel construction and renovation projects, usually as interest-only loans of up to 3 years, with an LTC up to 85%, and a lender loan fee of 1% to 2%, on a recourse or non-recourse basis. Another source of renovation financing is a mezzanine loan of subordinated debt. This debt resides below senior debt and above equity on the capital stack. Naturally, mezzanine loans increase leverage and are priced higher to account for greater risk. While acquiring mezzanine financing can be tricky, Assets America® can procure this type of financing for your hotel financing projects. Hotel conversions are a type of hotel renovation in which a hotel converts to a different flag, or a non-flagged property becomes a flagged property. Managed hotel conversions are financed by the parent corporation, and franchise conversions are typically refinanced through the franchisor. However, in some cases, a hotel conversion may require external funds, as when a flagged hotel becomes a non-flagged one. Assets America® is happy to provide this type of hotel financing. A hotel is a good candidate for acquisition if it is underperforming due to poor management, has deferred renovations or deferred maintenance, demographic changes, or some other reason. High-performing hotels are also candidates for acquisition (although they will carry a premium price tag) if they fit into a hotel brand’s long-term strategy. Typically, acquisitions are financed through Assets America® by conventional banks as well as SBA-guaranteed loans. 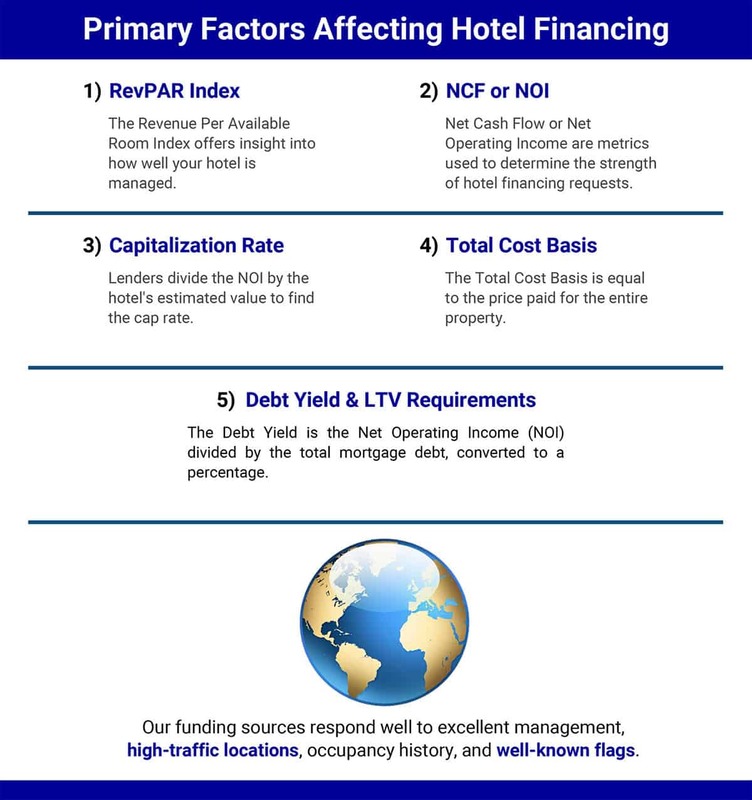 Hotels are candidates for refinancing under several circumstances. Typically, a newly constructed property is refinanced after it is stabilized at 90% to 100% of the RevPAR index. Lenders also look at metrics like occupancy levels, daily rates, expenses vs benchmarks, limited deferred maintenance, appropriate levels of reserves and maximized cash flow. Hotel construction loans and commercial bridge loans can be refinanced with a mini-perm loan and then a takeout loan. Alternatively, an existing mortgage can be renegotiated for better terms or to cash out equity. Assets America® does all of these types of hotel loan refinances. Without professional help, hotel financing and hotel construction loans can be a complex and daunting task. Assets America® serves as a powerful ally to its clients, drawing from greater than 34 years of experience in commercial finance. We start by using our marketplace knowledge and vast expertise to understand the details and specifics of your hotel project. With those details in mind, we match your project and its financials to the ideal hotel financing capital sources. For hotel construction loans and renovation projects, raising capital is of central importance. Tier-1 banks often display caution and favor low-risk projects and loan-to-value ratios. However, in recent years, there has been an explosion of lenders willing to provide hotel construction loans and other hotel financing options. These lenders include private lenders, lower-tier commercial banks, investment banks and mortgage bankers. While these hotel financing sources will accept higher risk, they also expect higher growth. That said, they tend to turn down fewer opportunities if the borrower has done their due diligence. One common pitfall is under-estimating the total cost of capital. This miscalculation often leads potential lenders to deny a loan request. With so many potential sources of capital available, it can be extremely time and resource-intensive to select the right hotel financing option. This is where Assets America® comes into play. The Complete Glossary of Hotel Finance Terms can provide assistance with the terminology involved with hotel loans. The Hotel Finance Q&A from Today’s Hotelier offers a number of insights for the potential or current borrower. Hotel News Now has a Data Dashboard to keep you up-to-date with all the latest in the hospitality financing world. Hotel financing is a complex topic that requires expertise and experience. Assets America® supplies both in spades and should be your source for all of your large-scale, hotel financing. We pledge to get you the hotel financing you need at the best possible price! See for yourself how our multiple decades of experience and commercial financial and sales services can help you realize your hotel financing goals. Call us today at 206-622-3000 for a free consultation!